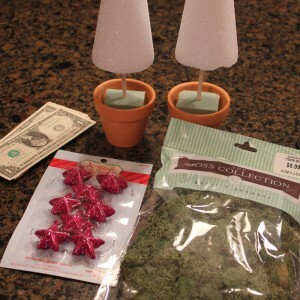 A “Money Tree” (pictured above) is a cute Christmas table decoration as well as a gift. It’s pretty easy and takes less than 15 minutes! Start with a small terra cotta pot, some floral foam, a dowel stick and a styrofoam cone. 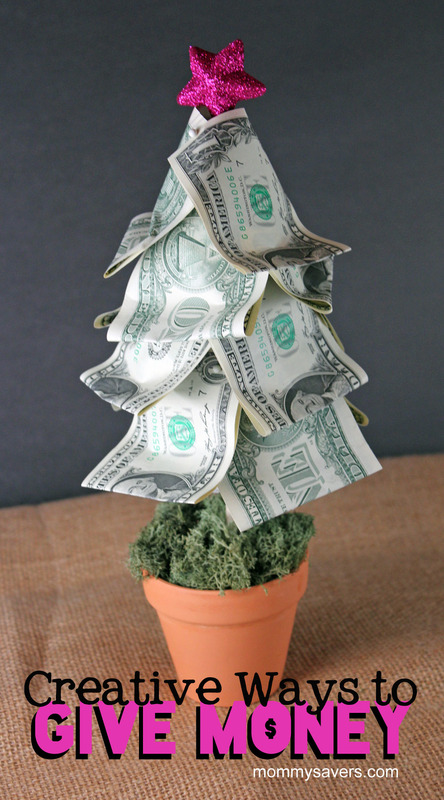 Simply pin your dollar bills to the styrofoam to make the tree’s branches. Add a little moss at the base of the tree, and a star on top. It’s very festive! 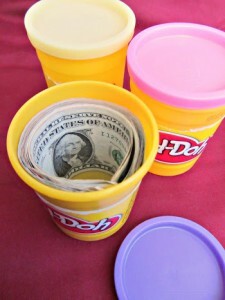 Reuse a Play-Doh container to hide money in as a gift. This gift idea works great as a stocking stuffer! Add a gift tag that says something like, “Here’s some ‘dough’ to play with this Christmas” for a funny play on words. Wad up the money you’re giving as a gift and start wrapping rubber bands around it. Keep wrapping until you have a nice big ball of rubber bands! Then wrap up the rubber band ball with the money inside and give that as a gift. 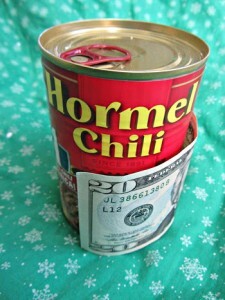 Use a canned food item to hide your cash gift! If there’s a food your recipient particularly hates, be sure to use that for extra laughs. Use a knife to slit the label at the back of the can, near the glued seam. Peel the label away from the can (on the side without glue) and slip the money underneath the label. Carefully glue the loose end of the label back in place, without gluing the money. A bill fits perfectly around a regular sized can without getting in the way of the glued area. 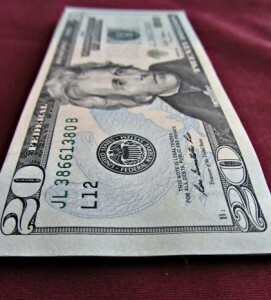 Make a “money pad” by glue a stack of bills together on one end. This is an easy and fun way to give cash as a gift. All you need is white school glue and money. New bills work best. I’ve done this, and the glue does not ruin your money! Kids especially will enjoy peeling the bills off the stack as they use them. Stack up a pile of bills neatly. Place something heavy, like a stack of books, very close to the end you want to glue. Apply the glue to the very edge of the stack of bills and allow to dry (mine took about an hour). The bills will peel off individually, like a notepad. You could also add a cardboard base to your money pad (cut a rectangle from a cereal box) or a note to the recipient on top of the money stack. I recommend using $1 bills, to make a more impressive stack. The money pad pictured is 20 bills and it’s not very big. Creative Way to Give Money #6: A Box in a Box – NOT! A friend of mine was out of work and very short on cash, but wanted to acknowledge my son’s birthday. She taped different lengths and colors of curling ribbon on the inside of the lid of a shirt box. She taped a $1 bill on the end of each ribbon. She wrapped the whole box like a regular present. When he opened the box, all the colorful ribbon hung down and made such a pretty display, he loved it! Craft stores sell mugs and cups that you can pull the inside of the mug or cup and attach a design to the inner cup and then insert the design cup or mug bag into the clear outside of that cup or mug. You can usually purchase these for under a dollar. Instead of coloring a design included with the mug or cup, I wrapped the mug with money and inserted back into the clear cup or mug holder. When finished your cup or mug is a perfect way to give money in a creative way. If you want your recipient of your gift to think you have gone off the deep end , place your designed cup or mug back into the original box and wrap it as a gift, this is really funny especially when you are giving to a older teenager.